A heart-healthy twist to a classic dessert. Preheat oven to 325° F. Spray four ovenproof custard cups with nonstick cooking spray. Prepare the water bath: Bring water to boil in a saucepan over medium-high heat. Meanwhile, in a mixing bowl combine the whole egg, egg substitute, milk, 1/4 cup plus 1 tablespoon of honey, grated lemon zest, and vanilla. Beat until mixed, but not foamy. In a separate bowl, combine 2 tablespoons of honey and cinnamon, and mix to blend well. Place the custard cups in a baking dish that is large enough to accommodate them plus the water bath. Spoon 1/2 tablespoon of honey and cinnamon into each custard cup. 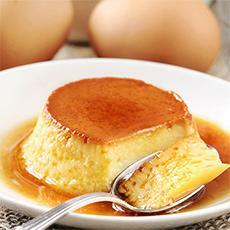 Divide the egg mixture equally into each custard cup. Place the baking dish on the middle rack in the oven and pour the boiling water into the baking dish to a depth of 1 inch, taking care not to let the water splash into the flan. Bake for 45 minutes or until a knife blade comes out clean when inserted. Serve warm or cold. Before serving, loosen the edges with a knife or spatula and invert onto individual dessert plates.